In my native state of Wisconsin, late summer is accompanied by the cropping up of local sweet corn stands. These stands, often run by honor system, are erected in gas station and grocery store parking lots, along roadways, and at the end of farmer’s driveways. Growing up, my family of four went through ears of golden yellow sweet corn by the dozens during this time of year. Now, in Jackson, I went looking for a little reminder of home, and sought out dishes around town that are celebrating the flavors of corn. Rendezvous Bistro has always impressed me with their ability to elevate the ordinary. I’m talking dishes I would normally associate with memories of family meals growing up. Think meatloaf, roast chicken and pork chops. Now, they’ve taken a simple vegetable like corn and transformed it into an interesting and tasty side. Their chipotle corn can be paired with any of the menu staples for a flavor kick, but the best combination is with the grilled pork chop, served with cabbage and mango slaw. Although I can’t get enough of Streetfood’s gyro, their Mexican chopped salad is boasting a variety of flavors and textures. Think corn, poblanos, black beans, tomatoes, onion, tortilla strips, and a citrus ranch dressing. In this salad, the corn kernels add refreshing bursts of flavor with every bite. If the stomach is the way to the heart, then the eyes are the way to the stomach. 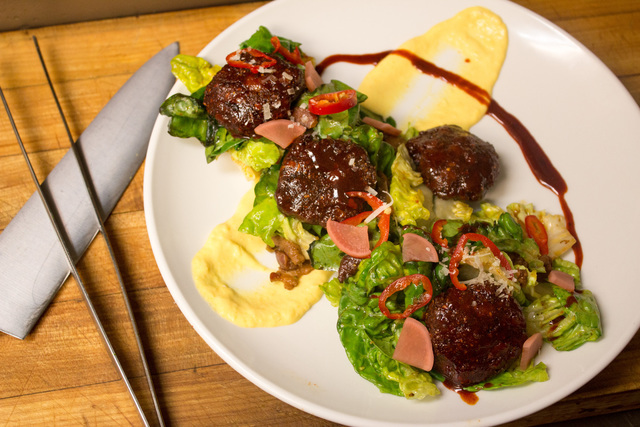 Gather’s “Posole” salad is as visually satisfying as the taste. Over at Gather, they’ve got intricate plating dialed, and I always hesitate to mix the components of a dish like this. Alas, it must be done. 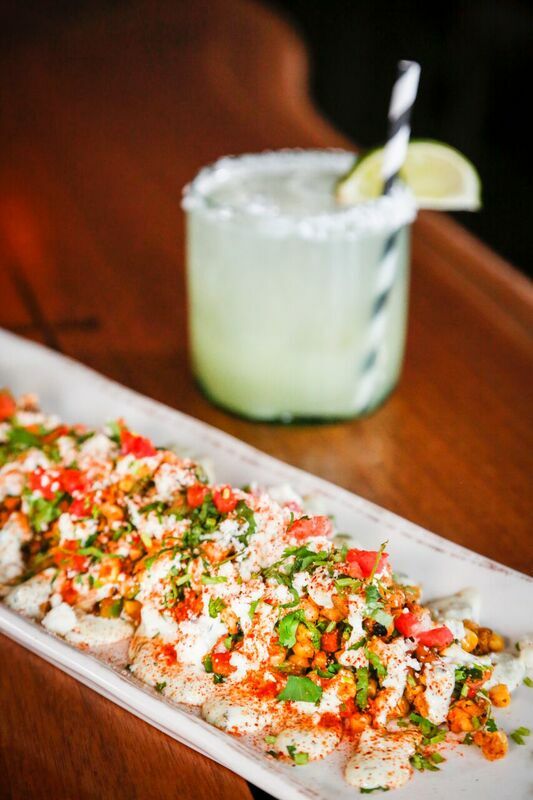 This dish features corn in two ways, with hominy corn fritters and a roasted corn and cotija cream. In addition, there is baby gem lettuce, shaved peppers, and a hot bacon vinaigrette. Once incorporated, each component adds flavor to the final bite. If you saw me at the People’s Market this summer, I was either in line for the Mexican street corn, or walking around with a cob on a stick in hand. As the market nears its end for the summer season, I was worried about how I would get my fix in the interim. 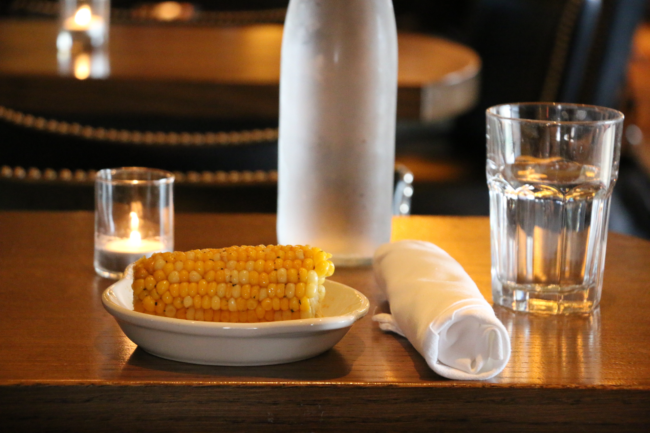 Imagine how thrilled I was to discover the Mexican street corn on the menu at Hatch. 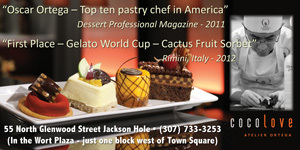 They’re serving it up with all the familiar, mouth-watering flavors, but without the mess of biting it off the cob. Instead, this street corn is served taco-style, on tortillas. Finally, I can eat Mexican street corn without the danger of getting kernels stuck in all my front teeth. Corn chowder I’ve heard of, but sweet corn bisque? That’s a first. Luckily, the White Buffalo Club is here to expand my narrow mindedness. The subtle sweetness lends itself nicely to the rich, creamy bisque. 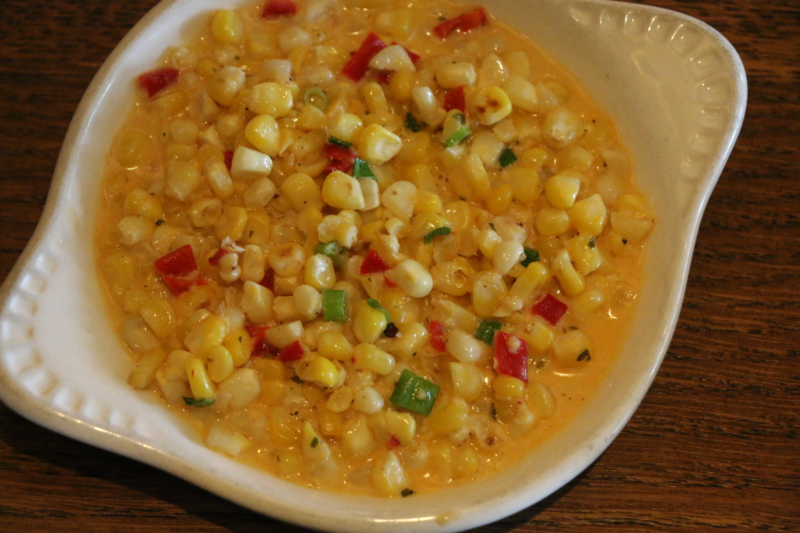 Better tell the lobster bisque to step aside, because corn is beginning to take center stage.